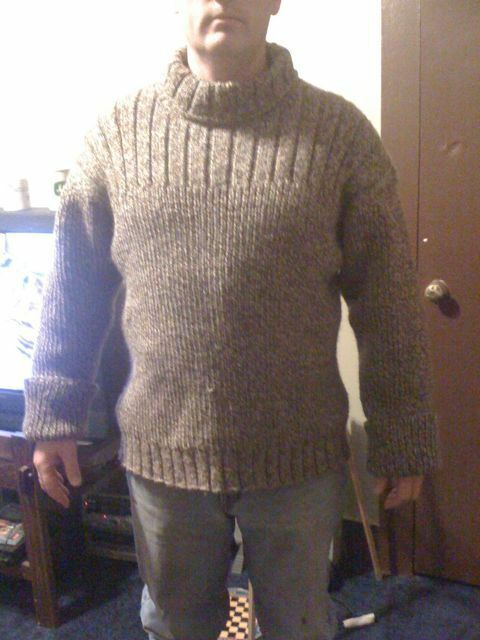 I knit a sweater for Jim a long time ago. It was the Fog sweater. It is lovely. It is going to be scrapped. It isn’t that he doesn’t like it, it is just that it is heavy. Extremely heavy. Think 20 lb sweater. That may be an exaggeration, but not by much. Needless to say since we live in the relative south (south of the Mason/Dixon line, but not by much) we don’t have really cold weather here. So I have 30 lbs of Cascade Eco Wool hanging out in lovely Fog form waiting to be something different. I have decided to take this opportunity and knit my own design. I haven’t completely decided what just yet, but I do know that I will be knitting something other than a pullover because this yarn is so heavy, I feel like it will get more use if it is not a pullover. I am also toying with the idea of trying steeking. I really haven’t had anything on the needles. Between baby, work and moving, I just haven’t made the time. My February shawl is in time out. Yes, it is April, but I obviously am not going to get a dozen shawls in. I didn’t run a lifeline, so I have to actually tink back two rows in lace. Ug. One day when I have had plenty of sleep and have peace and quiet (does this exist when you have a 6 month old?) I will go back and fix it. I have made a tiny bit of time to spin. I finished spinning the fiber that I got at the Knit Wits Christmas Party and I LOVE it. I think that I am going to leave the singles as is instead of plying them. I plied up a small amount and was not happy with how it looked plied. I don’t really have plans for the yarn yet. I would like to do socks, but I am iffy about doing socks out of singles. They need a little more stable yarn, don’t they? It would make gorgeous socks though so I don’t know. Once I get the other bobbin washed and set, I will decide what they are destined to be. It makes me want to spin more, but I am lacking in the fiber department. So as I mentioned before, we move (again). We found a 3 bedroom duplex 5 miles from my work. We LOVE it. It may not be a live here forever kind of place, but I think that we will probably be there for at least the next 3 years. We have plenty of room and it isn’t gross. Most importantly or maybe just a major perk, my best friend lives 3 streets over. Plus my friend Emily lives very close by too. Both of whom knit. 🙂 Yes this is one very happy knitter right here. I can’t explain how much being around someone who knits makes me want to knit even more. Add the mass amounts of knitting podcasts I have been listening to. *sigh* I need to buy more yarn.